Want to become a more mindful leader? With Mindful Leadership For Dummies, you'll find accessible and authoritative guidance for cultivating focus, clarity, and creativity from within your colleagues. Packed full of useful tips, this friendly how-to guide will help you incorporate mindfulness in your leadership style to manage and reap the benefits of a more attentive working life—all while nurturing compassion in the service of others. You'll discover how mindfulness can help improve decision-making and communication skills, manage modern workday challenges, and so much more. Mindful leadership is currently a high-trending topic in the self-help/business world, making headlines in such prominent publications as Forbes, Time magazine and The Guardian, and even earning a dedicated blog on Huffington Post. And all for good reason—the benefits of practicing mindfulness in the workplace are far-reaching, and as we begin to uncover more research that supports its effectiveness, it's no wonder business leaders are jumping aboard this positive bandwagon. 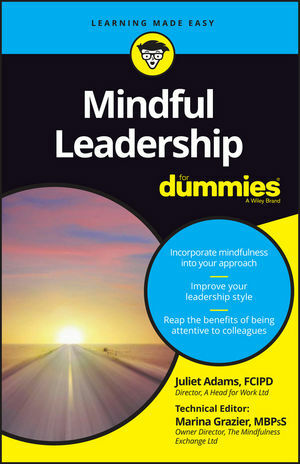 If you're a businessperson looking to add mindfulness to your leadership tool belt, Mindful Leadership For Dummies has everything you need to get started today. Juliet Adams is a learning and development professional who has pioneered workplace mindfulness training. A professional mindfulness teacher and trainer developer, she teaches internationally. Marina Grazier retrained as a Psychologist to pioneer mindfulness tailored for the workplace. Marina qualified as an MBCT teacher at Oxford University, and she now develops workplace trainers internationally.